Last month I made a Fall Table Runner for my dad’s formal antique dining room table in an attempt to make the room too pretty for me to keep using it as a dumping station for my craft supplies. Miraculously, it worked! I love the way that super simple leafy fall table runner looks on that table, and it seems from the response I have received that readers and the people of Pinterest love it as well! 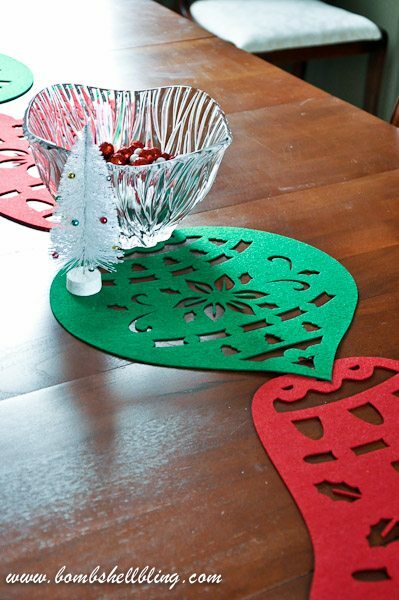 For that reason, when I was walking through Dollar Tree last week and spotted a variety of oversized thick felt Chrsitmas shapes I knew: I simply HAD to make a Christmas table runner! 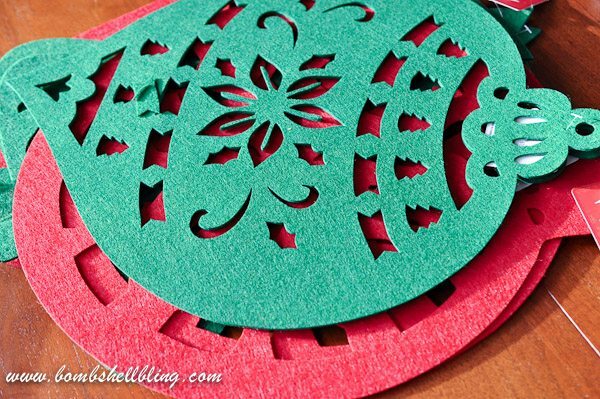 This will be the simplest “elegant” craft you will ever make, and it was crazy cheap as well. I labeled my fall leaf table runner as being made “for under $10 in under 10 minutes.” Well, my friends, I am here to tell you that THIS table runner was even cheaper and even faster. Under $5 in under 5 minutes. That’s right, people. And THAT is why I chose to share this project today as part of the Lightning Crafts series being run by 30 Minute Crafts and The Country Chic Cottage. 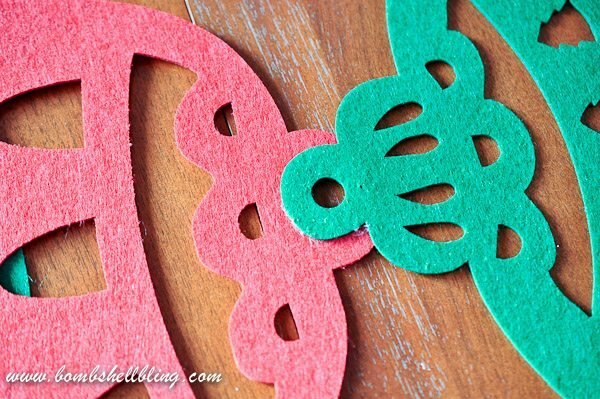 All you need for this project are felt shapes and a hot glue gun. I used four felt shapes that I found at The Dollar Tree. 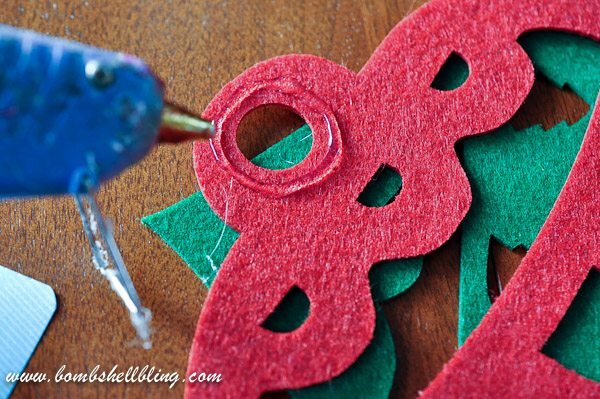 All you have to do is squeeze a bit of hot glue onto each shape and glue it to the next shape! Repeat until you are done! It’s one of the cheapest and easiest crafts that I have ever made, and now I can use it for years to come! I can forsee myself making one of these for every holiday…..I’m a dork like that. I find something that works and I do it over and over again, whether it’s a craft or a Target t-shirt that I buy in four colors. Seriously. 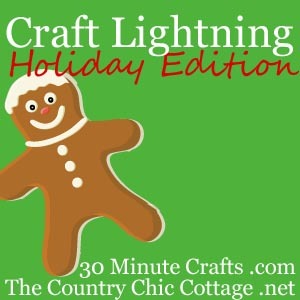 Be sure to visit 30 Minute Crafts and The Country Chic Cottage to check out all of the Christmas Lightning Crafts that have been going up this week! Every idea can be made in 15 minutes or less—you’ve gotta love that!! Be sure to follow along on my Christmas Pinterest board for more festive inspiration! So cute! What a great idea too. I love it!! Love it! But what’s with the Target t-shirt in 4 colors. Is it the dressy T? I happen to have that in 8 colors! No shame here! I love quick and easy projects that are also budget friendly. Thanks for participating Sarah. Super cute and inexpensive table runner! You are just brilliant. 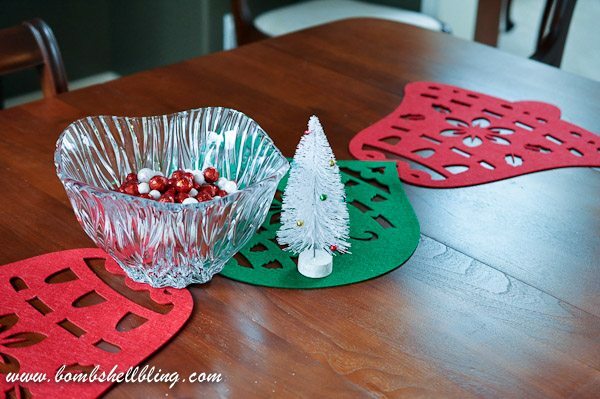 I see those cute “shapes” at the Dollar Tree and never thought to do a table runner with them. Thanks for the idea. The possibilities are endless. Why thank you! 🙂 I have made fall, Halloween, and Christmas versions. I think Valentine’s Day, Easter, and St Patty’s need to happen this year, don’t you? !